Korea's Information Society: North Korea's Moment for Mobile? The announcement last month by Egypt's Orascom Telecom that it had won a 3G license to construct mobile phone networks in North Korea bears close scrutiny. According to press reports, the company's subsidiary CHEO Technology, a joint venture 75 per cent owned by Orascom and 25 per cent owned by North Korea’s state-run Korea Post and Telecommunications, won the right to provide mobile phone services using 3G technology. This announcement was tantalizing news, for several key reasons. First among them is the recent history of North Korea's involvement with mobile communications. When China began building cell-phone relay stations along the North Korean border in 2003, the use of mobile phones with pre-paid cards became a hot black market item in North Korea. Defectors from North Korea have widely reported the use of cell phones to communicate with their families. The response of the North Korean government was an attempt to ban the use of mobile phones, including increased patrols using devices that detect cell-phone signals. Yet, in early 2005 Rebecca MacKinnon speculated in Yale Global Online that cell phone technology was poised to "re-shape the North Korean world view - seen through the Chinese peephole." In 2008, it remains "poised." To date, the North Korean government has shown its fear, politically speaking, of the free flow of information that cellular technology affords. 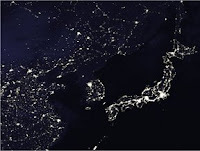 A second reason for interest in Orascom's announcement is that it includes plans to invest more than $400 million in infrastructure over the next three years, providing mobile phone service to North Koreans in all of their major cities. Should this happen, it will be a start toward erasing the world's most egregious digital divide, that between North and South Korea. Such a step is long overdue. However, such modern infrastructure comes with a price, that the leadership of North Korea must certainly understand. Any modern communications, network, particularly if it brings access to the internet, will also aid those who seek democratization. Finally, this announcement raises some interesting questions about China's influence on the modernization of North Korea's communications networks, versus the influence of South Korea. I think there is little question that the Korean language will be dominant within North Korean communications for some time to come. However, it finds itself today sandwiched between China and a lively South Korean democracy in which information flows freely through advanced networks and whose major coporations operate globally. To eventually reunify with the South Korea of "ubiquitous networks," it seems that the North will need to veer away from China's policy of attempting to control the internet toward the manner in which the South has embraced it.